Figure A. Alexa Fluor647 conjugated mouse anti human CD4 (MCA1267A647) and RPE conjugated rat IgG2b isotype control (MCA6006PE). Figure B. Alexa Fluor647 conjugated mouse anti human CD4 (MCA1267A647) and RPE conjugated rat anti human CD28 (MCA709PE). 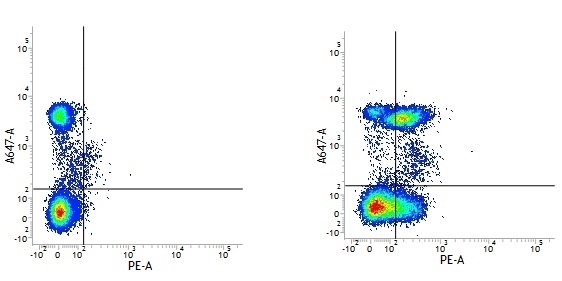 All experiments performed on human Peripheral blood lymphocytes in the presence of Human SeroBlock (BUF070A). Rat anti Human CD28 antibody, clone YTH913.12 recognizes human CD28, a ~44 kDa single pass type 1 trans-membrane protein expressed as a homodimer on a major subset of human T-cells (Thompson et al. 1989), responsible for activation of these cells via interaction with the TCR. CD28 is involved in the tuning of the T-cell for activation via TCR, lowering the threshold for activation from around 8000 triggered TCRs to approximately 1500 (Viola et al.1996). CD28 along with CD152, also known as CTLA-4 acts as a co-receptor for the co-stimulatory molecules CD80 and CD86 (Azuma et al. 1993). CD28 offers a positive stimulatory role on ligation of CD80 and CD86 while CTLA-4 offers a negative feedback signal preventing CD28 mediated T-cell activation of CD86 (Krummel et al. 1995). Rat anti human CD28, clone YTH913.12 has been reported to recognize an epitope of CD28 expressed by NK cells, which is not recognized by other anti human CD28 clones such as 9.3 and CD28.2 (Galea-Lauri et al 1999.) Other reports however have failed to demonstrate CD28 staining on peripheral blood derived NK cells using clone YTH913.12 (Wilson et al. 1999). Store at +4oC or at -20oC if preferred. This product should be stored undiluted. Storage in frost-free freezers is not recommended. This product is photosensitive and should be protected from light. Avoid repeated freezing and thawing as this may denature the antibody. Should this product contain a precipitate we recommend microcentrifugation before use. Store at +4oC or at -20oC if preferred.Storage in frost-free freezers is not recommended. Store at +4oC or at -20oC if preferred. Storage in frost-free freezers is not recommended. Reiter, C. (1989) Cluster Report: CD28 in Leucocyte Typing IV: White Cell Differentiation Antigens. Edited by Knapp, W., Dorken, B., Gilks, W.R., Rieber, E.P., Schmidt, R.E., Stein, H. and von dem Borne, A.E.G.Kr. Oxford University Press. pp 352-3. Galea-Lauri, J. et al. (1999) Expression of a variant of CD28 on a subpopulation of human NK cells: implications for B7-mediated stimulation of NK cells. J Immunol. 163 (1): 62-70. Gabdoulkhakova, A. et al. (2007) High rate of mutation reporter gene inactivation during human T cell proliferation. Pridgeon, C. et al. (2011) Regulation of IL-17 in chronic inflammation in the human lung. Clin Sci (Lond). 120: 515-24. Blanco, B. et al. (2003) Induction of human T lymphocyte cytotoxicity and inhibition of tumor growth by tumor-specific diabody-based molecules secreted from gene-modified bystander cells. Costa, C. et al. (2002) Human NK cell-mediated cytotoxicity triggered by CD86 and Gal alpha 1,3-Gal is inhibited in genetically modified porcine cells. Litjens, N.H. et al. (2011) Identification of Circulating Human Antigen-Reactive CD4+FOXP3+ Natural Regulatory T Cells. Goodier, M.R. and Londei, M. (2004) CD28 is not directly involved in the response of human CD3- CD56+ natural killer cells to lipopolysaccharide: a role for T cells. Wilson, J.L. et al. (1999) NK cell triggering by the human costimulatory molecules CD80 and CD86. Kropf, P. et al. (2007) Arginase activity mediates reversible T cell hyporesponsiveness in human pregnancy. Eur J Immunol. 37: 935-45. Ponchel, F. et al. (2002) Dysregulated lymphocyte proliferation and differentiation in patients with rheumatoid arthritis. McLeod, J.D. et al. (1998) Activation of human T cells with superantigen (staphylococcal enterotoxin B) and CD28 confers resistance to apoptosis via CD95. Svensson-Arvelund, J. et al. (2015) The human fetal placenta promotes tolerance against the semiallogeneic fetus by inducing regulatory T cells and homeostatic M2 macrophages. J Immunol. 194 (4): 1534-44. Hasib, L. et al. (2016) Functional and homeostatic defects of regulatory T cells in patients with coronary artery disease. J Intern Med. 279 (1): 63-77.